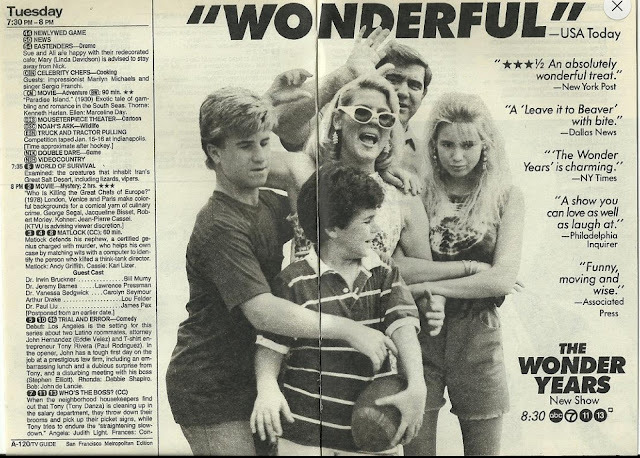 Here's a great TV GUIDE advert to accompany THE WONDER YEARS that I recently found online. It's undated but *I think* it was created to promote the launch of the weekly series, which debuted as a mid-season replacement (six episodes) on ABC on 22 March 1988. The show's pilot episode (surely one of TV's greatest ever opening instalments) aired after the SUPER BOWL on 31 January 1988. As there's no mention of the football, and the show's in its usual first season slot, I assume it promotes that first March outing. The New World series eventually ran for 115 episodes (the final two running as a back-to-back one hour special on ABC) across 6 seasons, ending in May 1993. The whole series was aired on Channel Four in the UK. Because of music licensing issues, the show isn't officially available on DVD. Even official reruns and download versions are cursed by multiple music substitutions.